The mother of this 75 gram brushtail baby was killed by a cat and furless baby was covered in scratches. Hence his name “Scratch”. Because of the infections from the cat scratches, and the fact that he was very young he was nursed day and night and lived for the first few months of his life in a beanie in an incubator. I was unable to leave him for more than a couple of hours at a time because of the need to feed and clean him. This regime involves total commitment – no holidays, no nights out, no weekends away etc. After a couple of months he was introduced to another little possum, with whom he was to spend the rest of him time in captivity. They shared the same beanie and slept in a basket. After three months they went into an indoor aviary where they climbed and played. Then a month later they were put outside in the big aviary. Five months after coming into care they were each fitted with a radio collar and were released from the aviary. From that time on we tracked them. 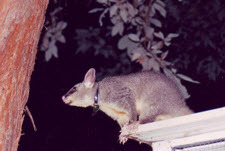 “Scratch” was a sedentary possum and he spent his time in the gardens of two neighbours, sleeping alternatively either in their garden shed or the car port. Life seemed good for “Scratch” and he settled in well. The local possums accepted him in their territory and the neighbours looked out for him and loved him. Despite the fact that one of those neighbours had a cat he managed to survive and thrive. Then, one night, exactly a year from the day he came to me and six months after his release into the wild he found a packet under a neighbour’s house that looked interesting. He nibbled through the soft cardboard and found the contents tasted good. He ate his fill. A couple of days later he was found in his bed with blood running from his mouth – dead. Everyone was concerned and upset and this led them to investigate. This was when they found the poison. A packet of Ratsack left carelessly under the house. Why, when nearly every item we buy in the supermarket has a childproof catch, is poison sold in soft cardboard packets? How many other little animals are meeting their deaths in this way?